“The road of life twists and turns and no two directions are ever the same. Yet our lessons come from the journey, not the destination.” ~Don Williams, Jr. Earlier this summer, while en route from my friend’s home in Calgary to Banff National Park in Alberta, Canada, my companions and I enjoyed seemingly endless views of blooming yellow canola fields along the highway. For a closer look, namely in search for a red barn to serve as a pleasing contrast between the blue sky and yellow flowers, we turned down a random dirt country road to continue our scouting. When we came upon this particular field while driving a dirt country road, we all agreed: we had to stop to photograph it (yes,despite no red barn)! When I surveyed the scene, I knew immediately that I wanted to showcase the juxtaposition between the yellow flowers and the non-blooming green weave as a leading line through the frame. To draw more attention to the contrast and to reduce the visual tension (thereby offering a greater sense of peace and harmony), I intentionally positioned the green shape in the middle of my composition and allowed even amounts of space for the yellow on either side to create a more symmetrical balance. I also wanted to give a broader context to the path as if it were leading into this great big sky – and into a great big unknown – so I dropped the horizon towards the bottom of the frame to emphasize the expanse above the landscape. As I perfected my composition with my 24-105 mm set at a 50mm focal length, the mid-morning sun kept playing hide and seek. One minute, the scene fell in completely diffused light. Then, the next minute, it appeared fully illuminated. Knowing that a viewer’s eye would travel along the green (darker) area to seek the brighter part of the frame, I waited patiently for the sun to dance across only part of the field, specifically the top part, where the path ends and meets the sky. For a mere few seconds, the sun cooperated before moving on and spotlighting a different part of the field out of my frame. I stayed put for several more minutes, hoping this lighting effect would return to the top of the ridge, but alas, it did not, and I chose to move on to additional compositions under almost completely diffused light. 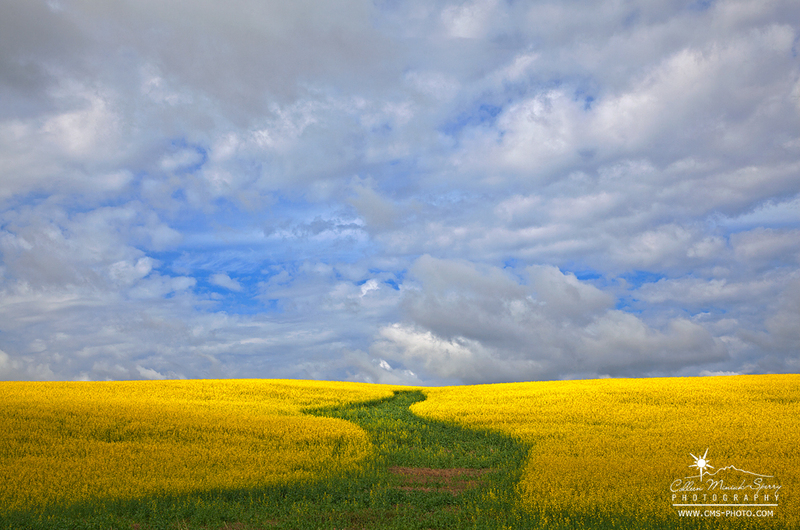 We never did find a blooming canola field with a red barn (found plenty of both, just not together!) but we enjoyed the journey to find it immensely. When I returned home to process the image, titling it came very easy. I named the resulting photograph after the Tom Petty and the Heartbreakers song, “Into the Great Wide Open” as that’s what I was humming while I made the image! Tech info: Canon 5DMII, 24-105mm at 50mm, ISO 100, f/11 at 1/250 sec.